Recently, my wife and I began a couple’s love journal titled Why I Love You—a love story, in our own words. Seven years had passed since we had last seen one another, and then, there she was again. A garland of plastic Hawaiian flowers adorned her neck as she sat on the back steps at Mary’s parents’ home in Keysville, Virginia. The occasion which brought us together again was a mutual friend’s engagement party: Becky Follin, soon to be Becky Liddell. Butterflies fluttered in my future wife’s stomach, according to her journal response, upon seeing me. I never knew this detail, until now. Recently, my wife and I began keeping a couple’s love journal titled Why I Love You: A Journal of Us, which serves to trigger your memory with prompts such as how you and your spouse met, including where and when; first words said to one another; the early days of the relationship; and so on. A love story in your own words, you could say. We made a decision to begin our story post-high school being that my wife and I have known each other since sixth grade, but only kindled our romance later in life. Even though we just started the love journal, I have thoroughly enjoyed writing in it, and would highly recommend the practice to any married couple, whether you’re a few years in or have been married thirty years. Not that my marriage is sailing in rough waters—it’s not—but I could see this journal benefiting marriages that are. It puts your relationship in perspective and places you back at the beginning, when the fire was just sparking and your life was beginning anew. It’s easy to forget the early years, particularly if you have young kids. Kids change everything. As wonderful as they are, it’s often easy to put your marriage on the back burner due to the energy required to take care of small children. This journal centers around you—husband and wife, not mommy and daddy. Also, if you’re widowed, this journal can still be beneficial. You can still write your love story, and for many, I can sense it being tremendously therapeutic. It’s worth noting that my wife does not enjoy writing (quote: “Writing stresses me out”), so if you think keeping a journal such as this is a chore, I assure you it’s not. It’s quite pleasurable. More than once, Allison has said she’d rather do just about anything than sit down and write, but this journal is different. The prompts inspire quick detail, details you’ve long stored away in your memory that are retrieved instantaneously. To keep this journal true to our own memories, my wife and I promised to one another that we would not peek at each other’s answers until after we had answered the questions/prompts ourselves. That way, we limit the risk of influencing each other’s answer/response/memory. Technically, and we didn’t realize this until after we started, we were supposed to buy two copies of Why I Love You, then trade journals upon completion to see how each answered. We both agreed we like the idea of keeping it all together in one book. It will be fun to look back on when we are old and gray, and having two copies ups the chance of misplacing one. It may sound crazy to some, but I knew as soon as I saw Allison that night—the exact moment I saw her sitting there on the back steps at Mary’s—I was going to marry her. Love at second sight you could say. This night was the re-entrance of Allison into my life, and from that point on, even though months would pass before I could convince her to go out with me, even though I dated a couple of other girls prior to Allison, I began strategizing how to find a way to see her not just once every seven years, but every day for the rest of my life. How about you—when did you fall in love with your significant other? Start a conversation on Facebook or leave a comment below. 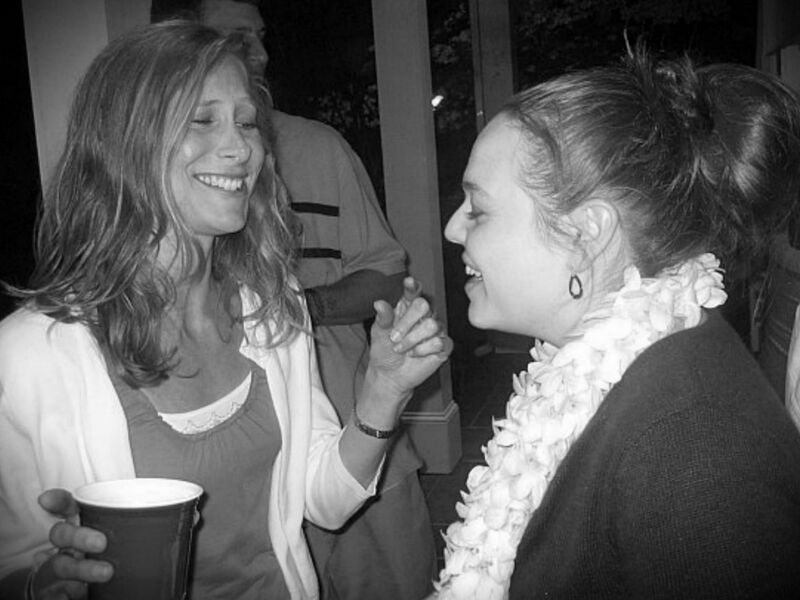 The header image is from the very night written about in this post—the night I saw Allison again for the first time since high school. She is to the left (no garland of flowers at the time of this picture, though they are on in other pictures). To her right is Becky. Behind Allison, you can see a glimpse of me.